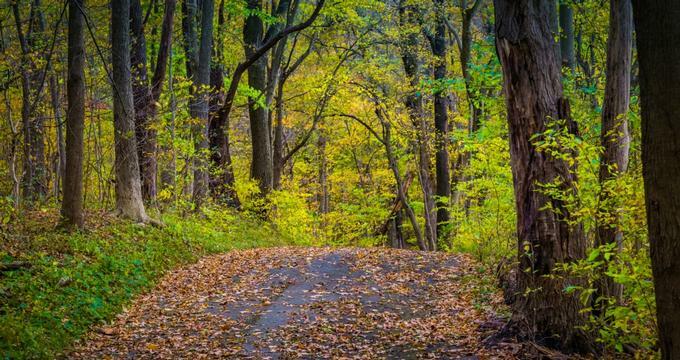 When the snow melts and trees are once more wearing their lush spring coat of bright green leaves, Pennsylvania residents head out to get closer to nature. The state has hundreds of state parks, forests, hills, romantic spots and lakes to choose from, with all kinds of trails running through them. From the almost 10-mile-long Wolf Rocks Loop Trail through spectacular Forbes State Park to the Pocono Mountains, full of magnificent waterfalls, you can find plenty of flat and easy trails to take the kids. Go on a simple hike through the greenery, like at the Alan Seeger Natural Area, or run up the sweat on the Turkey Path Trail coming out of the Pine Creek Gorge, the "Grand Canyon of Pennsylvania." Wolf Rocks Loop Trail is a 9.9-mile hike in the Forbes State Forest, Pennsylvania, a part of the Laurel Highlands Trail System. The trail passes by Beam and Wolf Rocks, both with wonderful views of the stream valleys below. Parts of the trail are overgrown and rocky, making it moderately difficult. The main trailhead is in Laurel Summit State Park, starting as the Fish Run Trail to the west, joining the Hobblebush Trail, and finally reaching the overlook at Wolf Rocks. 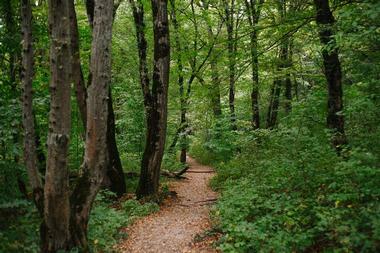 The trail runs mostly through remote areas, among dense outcrops of hardwood trees, mountain laurel, and rhododendron. The Beam Rocks outcrop is popular with rock climbers. With eight magnificent waterfalls and a lush, diverse landscape full of birds and wildlife, Bushkill Falls in Pennsylvania's Poconos region is one of the most popular holiday destinations in Pennsylvania. There are four main hiking trails that are different in length and difficulty level, with a mix of dirt and raised walkways. The Green Trail is only about 15 minutes long and an easy trail, with some stairs that will take you to the Main Falls. The Yellow Trail takes 45 minutes, leading to the Main Falls, Lower Gorge Falls, Upper Canyon, and Laurel Glen. The Blue Trail takes about 1 hour and Red Trail, 2 hours long, covers about 2 miles and all eight falls. Dingmans Ferry Creek Trail is short, 0.4-mile mostly flat boardwalk trail through the lush greenery of a hemlock ravine. Only the last 0.1 mile of the trail is stairs. You will pass by a thin ribbon of water of the Silverthread Falls as they drop 80 feet through a narrow chute. The boardwalk is surrounded by dense rhododendron bushes and a shady canopy of tall hemlock. The sound of the powerful waterfall will follow you all along the trail until you reach the base of the Dingmans Falls at the end of the boardwalk. From there, you can climb a steep staircase to the upper falls to enjoy a magnificent view. Glen Onoko Falls trailhead is located in State Game Lands 141 outside the village of Jim Thorpe, Pennsylvania. It is one of the most dangerous and most beautiful hikes in the state. While the trail starts off easily enough, it is very challenging, slippery, narrow, with many rocks and boulders, and in some places, you will need to pull yourself up the hill. Proper hiking boots are essential. Start by going under the train tracks and head uphill into the woods. Follow the stream and stay on the path. You will pass Glen Onoko Run, which, when the water levels are high, falls down the hill in a series of cascades. While steep and difficult, the trail is short, only about half a mile, ending at the base of Chameleon Fall, which is two streams that merge, creating an impressive curtain of water. Located between the towns of Cammal and Slate Run in north-central Pennsylvania in Tiadaghton State Forest, the Golden Eagle Trail is a rugged, strenuous hike that gains 2,247 feet in elevation. This 9-mile loop trail runs through dense forests of massive old pines, along two lively streams rushing through hemlock-covered gorges, passes by a number of lovely waterfalls, old logging camps, fascinating rock formations, old quarries, and splash dams, ending with a climb up Raven’s Horn and a spectacular view of the Pine Creek valley. Watch for snakes sunning themselves on warm rocks and look out for bears. 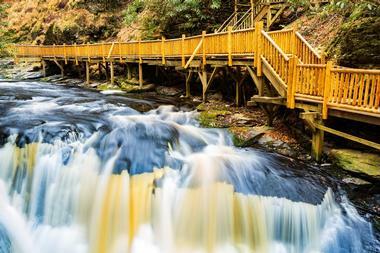 Ricketts Glen State Park in Luzerne County is famous for its 21 falls, which can all be visited during a single hike. However, if you have time for just one, then the Adams Falls Trail will take you to what is probably the park’s most beautiful waterfall after only 1 mile of fairly easy hiking. Adams Falls is part of Kitchen Creek, which continues its rush towards other waterfalls in the park. It has two main drops; the first is a 25-foot drop through a narrow chute in the rock that is incredibly fast, ending up in a lovely pool. From this pool, the water drops another 10 feet into a larger pool in two separate chutes. It is an easy, lovely, and short hike and the surrounding nature is lush and lovely. The 8,500-acre Cook Forest State Park is known for its magnificent old growth forest of towering hemlocks and white pines. A 13-mile long stretch of the Clarion River runs through the park, making it a wonderful place to enjoy unspoiled nature. The best way to do it is to take one of 16 well-marked trails that run through the park for 30 miles. One of the longest is the 4.1-mile Bridle Trail, which consists of two trails that are also permitted for horses. One trail joins the scenic Browns Run Trail and is a great place to look for wildlife and birds. The other bridle trail begins at Forest Drive and joins the Old Logging Road Trail and is flat and easy. Both trails are in the part of the forest that is open to hunting, so be careful. The Forest Cathedral is by far the most beautiful area of the popular Cook Forest, with a network of trails running among massive hemlocks, beeches, white pines, black cherry, and rhododendron bushes. The dense canopy of ancient trees creates an uplifting, spiritual feeling, like being in a natural cathedral. One of the favorite trails in the network is the Rhododendron Trail, a 1.2-mile moderately difficult trail that begins between Indian Cabins 6 and 7. It passes the swinging bridge that crosses Toms Run Road and ends on Forest Drive. The trail is particularly beautiful in spring, when the rhododendrons are covered in a riot of purple blooms. Linn Run State Park is a 612-acre scenic area with interesting topography and lush evergreen and hardwood forests. The park is very popular for hiking and picnicking. The Linn Run stream runs through the park and is full of trout, making it popular with fishermen. One of the most interesting trails running through the park is the 0.5-mile Flat Rock Trail, which ends at a large, smooth rock in the stream. Unfortunately, swimming is not allowed and it can get slippery, so walk with care. Worlds End State Park is a 780-acre park in the narrow Loyalsock Creek valley just south of Forksville. The park is surrounded by the Loyalsock State Forest and is an important bird area and a home to a large number of wild animals. There are more than 20 miles of hiking trails running through the park, which are generally rocky with steep sections going up the surrounding mountains. The Canyon Vista Trail is a 2.9-mile loop trail that runs under the dense canopy of mature sugar maple, ash, and black cherry trees, with wildflowers thriving along the trail. The trail ends at the beautiful view of the Loyalsock Creek gorge at 1,750 feet. Located in the southern end of the Laurel Ridge, Ohiopyle State Park is 20,500-acre rugged, natural area and the gateway to the spectacular Laurel Highlands. The heart of the park is the scenic Youghiogheny River Gorge. Hiking in the park is strenuous and challenging. The Baughman Trail is a 3.4-mile very difficult trail that starts at the visitors center in the town of Ohiopyle and gains 1,745 feet in elevation. It is mostly rocky and steep and passes Baughman Rock, which offers a spectacular vista of the Youghiogheny River Gorge. While most trails through Ohiopyle State Park are rugged and challenging, the Jonathan Run Trail is an easy, 1.7-mile long hike with the trailhead on the Holland Hill Road and an elevation gain of only 419 feet. The very pleasant and shady trail crosses Jonathan Run several times and passes by Jonathan Run Falls and a few other small waterfalls. The trail links to the Great Allegheny Passage. One of the most scenic trails in Ohiopyle State Park, the Meadow Run Trail is 3 miles long with an elevation gain of 538 feet. It has two trail heads – at the waterslide close to the ranger station and at Cucumber Falls. The trail starts with a steep uphill hike through a nice shady forest. From the top of the hill it winds downhill to a big rocky outcrop before continuing along Meadow Run until it reaches the Youghiogheny River. Along the way you will see the lovely Cascades Waterfalls and the Flat Rock sandstone outcrop, which offers wonderful views of the gorge. The Forbes State Forest covers more than 50,000 acres in three counties, following Laurel Ridge, part of the Laurel Highlands, and offering spectacular hiking opportunities through forests, up mountain slopes, and along fast mountain streams. The Cole Run Trail is only 2 miles long and starts at Cole Run Falls, going south along Cole Run. It runs through a deep forest full of fragrant mountain laurel trees, and you will encounter a whole network of waterfalls. On the way back, the trail follows Blue Hole Creek. The Alan Seeger Natural Area is a perfect spot to bring kids on a hike. Less than a mile long, with less than 50 feet in elevation gain, the trail is surrounded by massive trees, runs through rhododendron tunnels, over bridges, and across a creek. It is well marked, with logs along the edge of the trail for most part, but even the portion through a thick tunnel of rhododendrons is easy to navigate. The area is known for magnificent old hemlocks, which are visible from the trail. You will cross four bridges and there is a short climb after the last bridge. Ricketts Glen State Park is large 13,050-acre park in Sullivan, Luzerne, and Columbia counties. It is a fabulous area to explore, with 22 wild, fast waterfalls cascading through deep clefts in the ancient hillside. The Falls Trail is surrounded by old growth forests that are home to diverse wildlife. The trail is a 7.2-mile loop, mostly difficult and rocky, steep, and slippery, but the lovely scenery is well worth it. The trail runs along 21 magnificent waterfalls that range from 11 to 94 feet in height. Pine Creek Gorge, also known as the Grand Canyon of Pennsylvania, is a 47-mile-long and 1,000-feet-deep gorge that Pine Creek has carved into the Allegheny Plateau over the eons. The Turkey Path Trail is a 1.7-mile loop trail that descends to the bottom of Pine Creek Gorge. It is very scenic, with the views of the gorge and the creek, but it can be slippery and is very steep, with a large number of stairs cut into the rock. The hike on the way back requires a high level of fitness and good footwear. 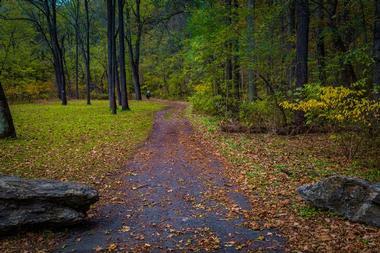 Hickory Run State Park is a 15,990-acre park in Carbon County in the foothills of the Pocono Mountains. The park has more than 40 miles of hiking trails, includes three natural areas, miles of streams full of trout, and the fascinating Boulder Field, an area covered in large boulders. One of the most scenic trails is the Shades of Death Trail, a 2.2-mile hike that runs alongside the stream, passes by a number of dams and waterfalls, and offers spectacular views. It is shaded by tall trees, mountain laurel, and rhododendron. Ricketts Glen State Park is a 13,050-acre, incredibly scenic area by Red Rock Mountain that spreads over three counties, with a series of glens that form 22 waterfalls. It is one of the most beautiful and scenic areas in Pennsylvania. The Grand View Trail is 1.9-mile, fairly difficult trail that will take you to the top of Red Rock Mountain through blooming tunnels of rhododendrons and mountain laurel. The trail is steep and slippery but the view from the top is spectacular. Rothrock State Forest is a 96,975-acre forest spread over the ridges of three counties in central Pennsylvania and is known for its seven mountains. There is a rich network of trails that transect this lush natural area. The Shingletown Gap Trail meanders through the Shingletown Gap Area, with the Roaring Run streaming through, surrounded by dense forests full of wildlife. Most trails are natural and can get muddy after a rain, but there isn’t much elevation. The area is very popular and can get crowded. Hawk Mountain Sanctuary is a 2,600-acre nature reserve in southeastern Pennsylvania. Established in 1934, the sanctuary is the world’s first refuge for raptors. The annual hawk migration attracts thousands of tourists, who enjoy the sanctuary’s scenic trails as well as the spectacular scene of the raptors flying just above the ridgetops. There are a number of scenic overlooks from 1,300 to 1,500 feet, where it is possible to see more than 235 species of birds. 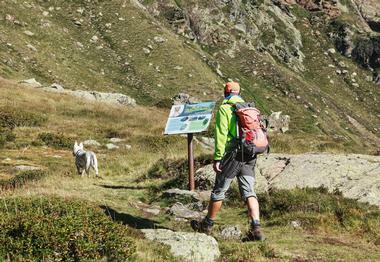 The trails leading to lookouts differ in difficulty, but there is one for every level of fitness. Ringing Rocks Ramble is a 0.8-mile, moderately difficult loop trail located near Upper Black Eddy, in a park on a hillside above the Delaware River. The trailhead is at the parking lot of the Ringing Rocks County Park. The flat, single trail leads into the park for a few minutes before you come across the Bridgeton Boulder Field, a 7-acre field containing what is known as the "ringing rocks" because the rocks make a strange singing sound when hit by a hammer. After having fun hitting the rocks, walk for about 10 minutes down the trail to your right until you come across High Falls, the largest waterfall in Bucks County. The Jacobsburg Environmental Education Center is a 1,168-acre state park close to Wind Gap in Bushkill Township, Northampton County, near the foothills of the Pocono Plateau on the northern edge of the Lehigh Valley. The habitats in the rolling terrain around the center range from grassy fields to mature oak forests. 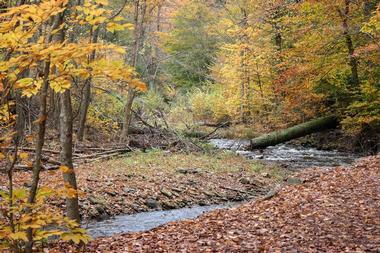 A large part of the Bushkill Creek as well as Sobers Run, its tributary, run through the center of the park. Besides being a great resource for environmental education and interpretation, the park is a wonderful recreation area for those who enjoy hiking, fishing, and hunting. There are 18.5 miles of easy, wide, flat trails through the dense forest that can be used for hiking, biking, and cross-country skiing. Presque Isle State Park is a 3,112-acre state park on a sandy peninsula on Lake Erie, located about 4 miles from the city of Erie in Erie County. Pennsylvania’s only "seashore," Pesque Isle has miles of lovely sandy beaches and diverse ecosystems that are home to a large number of birds, some endangered and rare. Presque Isle is a popular day-use park that offers facilities for year-round recreation. The park has almost 11 miles of natural hiking trails, while the 14-mile paved Karl Boyes Multi-Purpose National Recreation Trail runs along the lake and Presque Isle Bay. Promised Land State Park is a 3,000-acre park in Pike County, Pennsylvania, on the Pocono Plateau about 1,800 feet above sea level, almost completely surrounded by the Delaware State Forest. There are about 50 miles of well-marked hiking trails that run through dense forests of oak, beech, maple, and hemlock trees, and beside two clear lakes and small fast-running streams. The Popular Bruce Lake Trail will take you to a beautiful glacial lake, and you can cool off at the small waterfalls by following the Little Falls Trail or hike the loop trail around Conservation Island.